Jamie here! I meant to post this yesterday – but the boys had a friend sleep over and my whole evening got turned upside down! Here it is a day late! 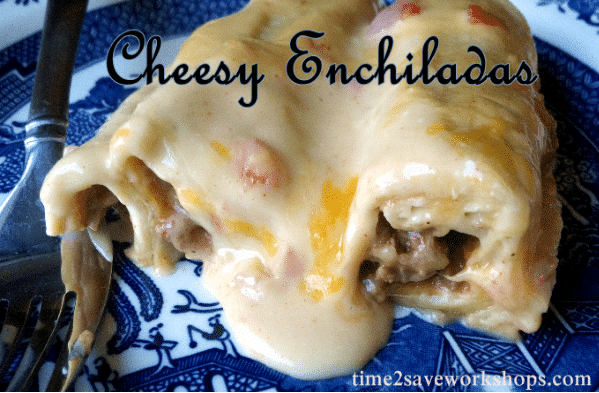 Here’s my recipe for Easy Cheesy Enchiladas – I hope you and your family enjoy them as much as we do! 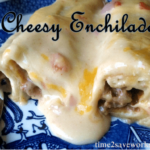 Here's my recipe for Easy Cheesy Enchiladas - I hope you and your family enjoy them as much as we do! Brown the beef and saute the onion together in a large skillet. Drain off excess grease. Turn down to simmer and stir in half the Rotel & ALL the Refried beans. Add 3/4 packet of taco seasoning and simmer for 10 minutes. In a saucepan on medium-low, heat remaining Rotel and Cream of Chicken Soup. *For an extra kick - divide a can of green chiles between the meat and the sauce while cooking. This gives it a great flavor! Roll each tortilla up and place crease-side down in an 8x11 (or 11x14) pan. Once all the tortillas are rolled up and in the pan, pour the remaining cheese sauce over the top, covering all the nooks and crannies. Bake for 20 minutes, and then remove and sprinkle cheese on top. Made these last night and they were FANTASTIC! Will keep for sure!!! So glad you liked it Laurie!! Do you drain the juice off the black beans?